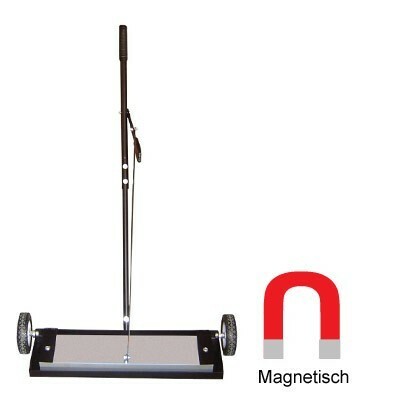 Magnetic sweepers are the best solution for quick, easy and safe cleaning of large areas for nails, swarf and other metal objects. For large car-park areas, you simply cannot go past the speed and efficiency of a magnetic sweeper for picking up objects that may punture tires, etc. Magnosphere magnetic sweepers offer the lowest cost, reliable solution to the problem of collecting all types of ferrous waste. The magnetic sweepers will collect nails, screws, pop rivets, off-cuts, blasting shot, swarf, punchings and all other types of ferrous waste. Suitable for clearing: Transport yards, workshops, around machine tools, waste skips and car parks, at a brisk walking pace; in any weather, even in standing water. 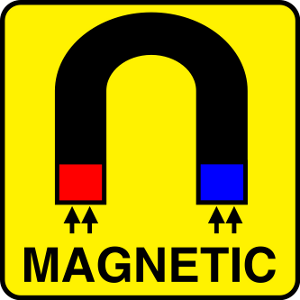 Fitted with specially developed very powerful, permanent anisotropic ceramic or a choice of neodymium magnets with a long life. 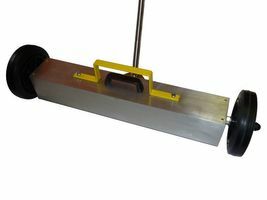 Sheathed in stainless steel, magnetic sweepers will survive even the most harsh industrial applications and environments. With a powder coated finish and needing no maintenance, they are always ready for instant use. Solid wheels make them light to push, and with a ground clearance of 25mm, they can operate effectively in most conditions, including standing water. 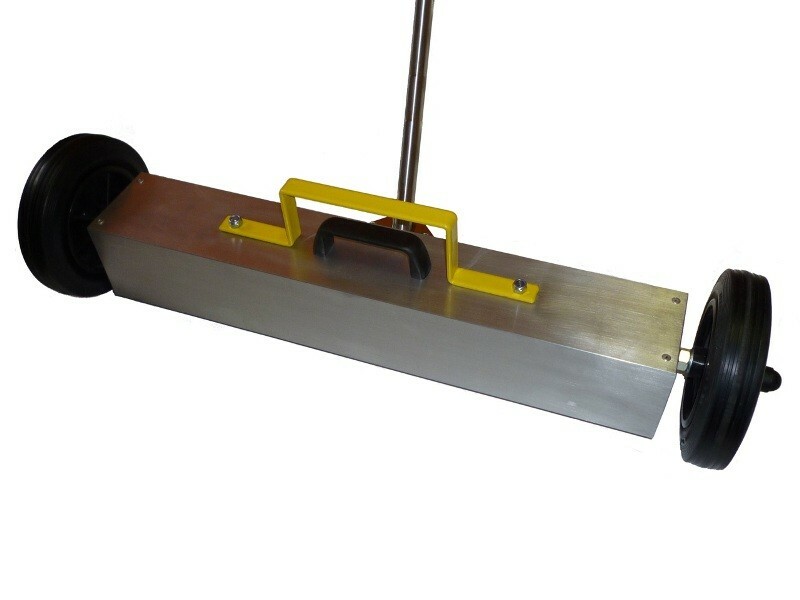 Magnosphere magnetic sweepers come complete with a collection tray, for safe disposal of waste, and can easily be transported from site to site using built in lifting handles.